Hi, remember me? Ben ... Woo? I have been a shamefully neglectful blogger over the last several months. My excuse is that I was buckling down / swotting up to finish writing my dissertation and prepare for my defence. Last September, I decided that I would finish my doctorate in this academic year, come hell or high water. For a while, it looked as though administrative snags would prevent it, but I kept pushing and scheduled my dissertation defence for August 13. As the big day approached, I struggled with my presentation. It's a very strange set-up, as some of the audience (the examining committee) has read the manuscript and are just waiting to ask the questions they've prepared, while the majority of them hasn't. But, as my friend Dylan reminded me in the lead up, my fate was probably already decided before I walked into the room. In any case, I re-wrote it a couple times, threw my slides out and started over with a few days to go, and rehearsed the whole thing ten times over the weekend. I prepared a few notecards for questions I considered likely, but didn't end up using any of them. The best thing I did to prepare for questioning was read this article on surviving vivas that I found in my twitter feed with three hours to go until the defence. There were some minor technical hiccups getting started (in the end, I fixed it by doing what I should have done first: try turning it off and on). In addition to my supervisors, we were joined by Bart Beaty from the University of Calgary, who was serving as my external examiner, and Cindy Patton of SFU's Department of Sociology and Anthropology, who was acting as internal examiner, and something like 18 friends and colleagues--I understand this is a pretty much unprecedented turnout for an August defence. 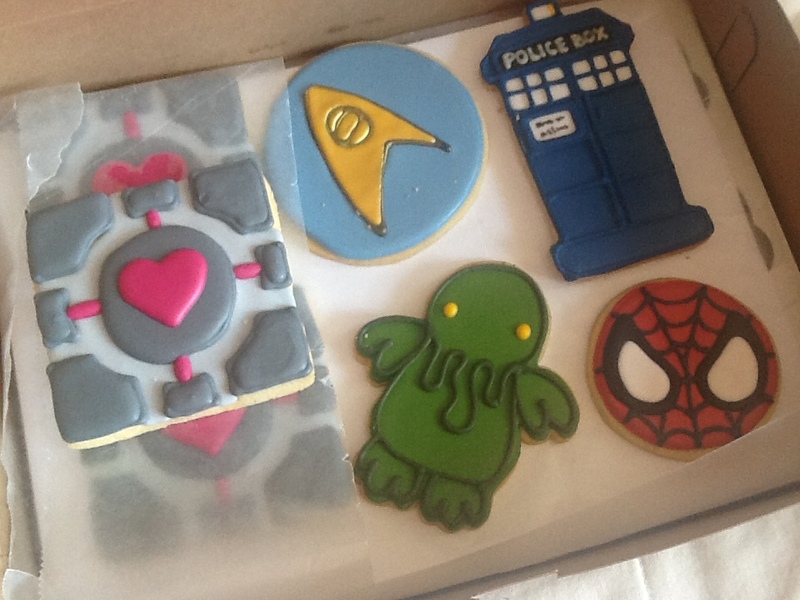 But, then again, I had heavily incented them by posting photos of the Geek Sweets cookies that I ordered specially for the event. Honestly, I don't remember too much from the proceedings, other than a tremendous pressure to just keep talking. Reliable witnesses tell me I did okay. Based on my previous experience (my own Master's defence and friends' defences I had recently attended), I was expecting some time to chat with everyone while the committee deliberated. However, they decided not to keep me in suspense, and called me back into the room after just a few minutes. The verdict was a pass with no revisions, meaning that I could start irritating all my friends by insisting they address me as "Doctor Woo." I was overwhelmed and didn't really process much of what happened for the rest of the day. I received a lot of encouragement online from absent friends in the lead-up, and my heart was warmed by the many congratulations I received afterwards. I owe a great deal of thanks to my supervisor, Gary McCarron, and supervisory committee members, Shane Gunster and Stuart Poyntz. Thanks to Bart and Cindy for being part of the defence, and to Richard Smith for presiding over the examination. Thanks to everyone who came. Most especially, thank you for everything, Laurena.